Russ Olsen, author of Eloquent Ruby and Clojure developer, spins a tale of an archaic CAD program, politics, and progress that can be summed up with one simple mantra: "Stay the hell out of other people's code!" Read Russ Olsen's book, Eloquent Ruby, or more than 24,000 other books and videos on Safari Books Online. Start a free trial today. Ruby, with Clojure a close second. The best programming advice I ever got came to me early in my career while I was working on a system that I simultaneously loved and hated. The cool part of that system was that we were doing computer aided designthink Adobe Illustrator, but for engineers. In those days CAD, with its interactive graphics, was the highest of high tech. The thing I hated was that the thing was slow, painfully slow: You would sit there and watch the picture appear line by painful line. A simple drawing would take tens of seconds, while displaying something complicated was an opportunity to get coffee. The performance of that system was horrendous even by the standards of the primitive computers we had back then, which is saying something. What was a hacker to do? What would *you* do? What I did was to dig into the code. Even though the graphics were not my assigned area, I spent some evenings and weekends happily hacking away, trying to see why things were so slow. It didn't take me long to find the problem: When you kicked off that system, you actually started two processes. One process was the CAD system proper, while the second process did all of the drawing. The two programs talked to each other over a socket-like network connection. Apparently, the programmer behind the graphics subsystem had fallen in love with client/server style programs and had cooked up one of his own in our CAD system. The rub was that since we were running on such primitive hardware, squeezing all of the drawing down a narrow socket was costing us an order of magnitude in performance, a cost that we were paying for no good reason. I spent the next weekend hacking together a version of the system that packaged everything in a single process. The difference was dramatic. Simple pictures now drew more or less instantaneously while more complex ones would only take one sip of coffee to finish. Monday morning I demoed my hacked up version over and over: First to my boss and then to my boss's boss and then to his boss and then to a whole assortment of higher ups. And then all hell broke lose. Many of those boss's boss's bosses were seriously pissed at me, though no one could or would articulate exactly why. Some of my co-workers started treating me like I had contracted an infectious disease. Slowly, I figured out that I had jumped into the middle of some complex interdepartmental power struggle. In my own clueless way I hadn't sped up the graphics so much as I had supplied a war winning weapon to one organizational faction and the other factions were not happy. Eventually, grudgingly, they did away with the second process along with the socket and we got our faster graphics. Nevertheless elation seemed thin on the ground. "In the future, stay the Hell out of other people's code." Actually it was terrible advice, advice that I've gone out of my way to ignore in the years since. But those words were valuable nevertheless, and I've gone back to them time and again. Every time some annoying new hire comes to me with a dumb idea that is obviously not going to work, "Stay the Hell out of other people's code," plays back in my head and I listen harder. Every time some other engineer has an opinion about *my* code, I remember what I thought of the idea that you should mind your own technical business and I try to disengage my ego. In later years, as I found myself building and managing software teams, I've realized that there were probably a dozen programmers on that ancient project who knew why the system was so slow and how to fix it. They knew, but they kept it to themselves because in that organization, there were some things that were more important than making the system better. 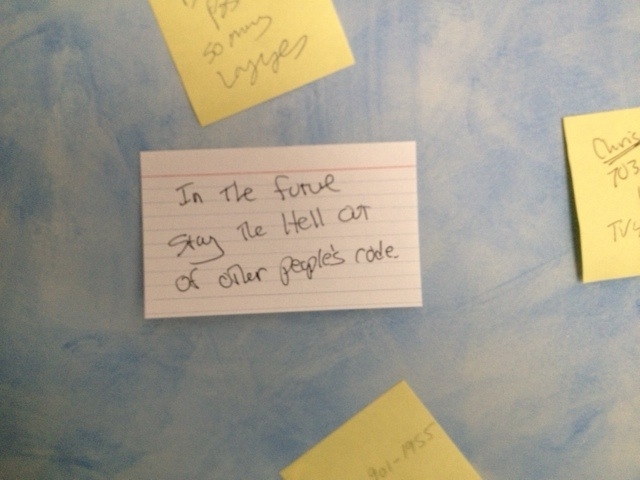 "In the future, stay the hell out of other people's code," assumes there will be a future. But the best way to have a future is to be part of a team that values progress over politics, ideas over territory, and initiative over decorum.